Honda has a habit of stealing the spotlight, no matter where it happens to be. The Chicago Auto Show was no exception with the full lineup making an appearance. The new Odyssey minivan showed off its new design with pleasure. Meanwhile, enthusiasts raved about two new concept vehicles. 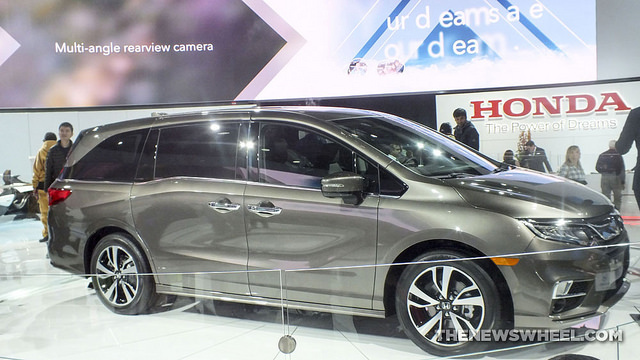 While the Odyssey doesn’t arrive until later this year, the minivan certainly turned heads at the Chicago Auto Show. Sleek curves and a tapered rear end offer a refined style while the interior was certainly something to be proud of. The family-oriented interior boasted a plethora of space as well as a whole host of technology features, including Apple CarPlay and Android Auto compatibility. As always, safety comes standard and the in-car vacuum offers parents a convenient way to clean up. Drawing inspiration from its motorcycle roots, Honda debuted a concept vehicle unlike any other. Known as the Honda Project 2&4, the motorcycle-car features four wheels, a single seat, and a motorcycle engine that delivers 212 hp and 87 lb-ft of torque. While it weighs in at only 900 pounds, it’s still legal to drive on public roads. Project 2&4 comes from a design competition between Honda’s designers and serves as a nod to the heritage of the Japanese brand. We here at Hardin County Honda are pumped to see what Honda brings to the next auto show!